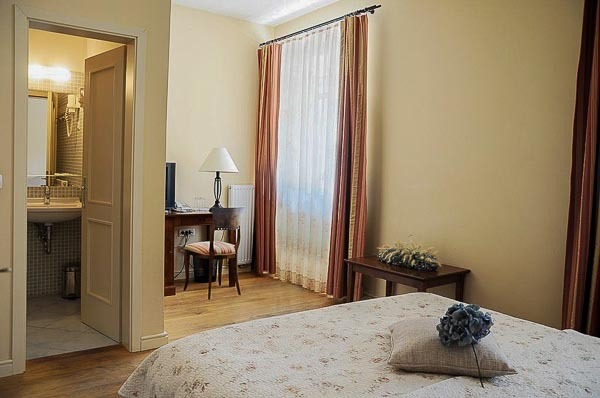 B&Bs can be a great and more homey alternative to hotels and hostels, same as pensions and guesthouses when in search for lodging in Ljubljana. A pension is a type of guest house or boarding house in Continental European countries that typically offers not only breakfast, but also lunch, dinner and are, much like B&Bs and guesthouses, often family run. These types of accommodation present some major benefits such as personalized attention, healthy and homemade food and inexpensiveness. 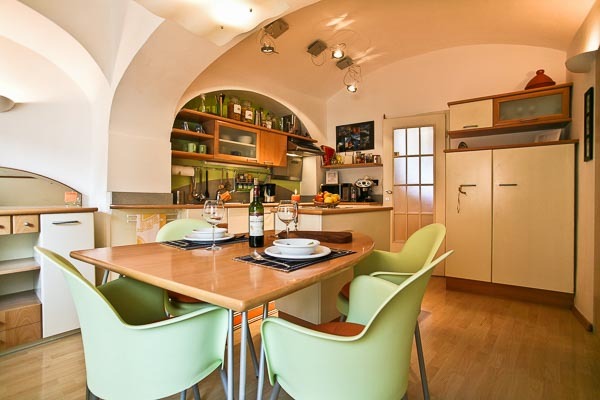 This B&B is located in the centre of Ljubljana in the old town, near to the open air market under the castle and only 15 minutes away from the railway station. It is set inside a courtyard so you shouldn’t worry about noise. 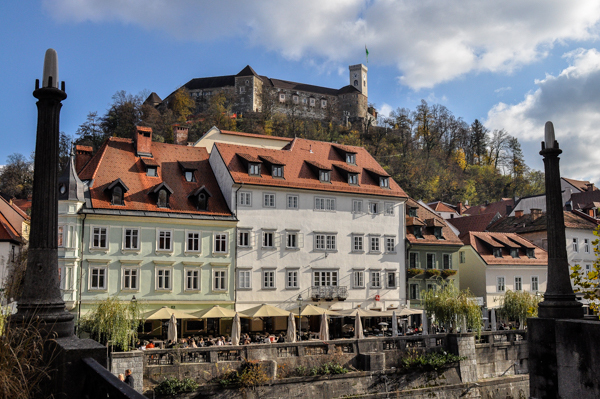 The restaurants and bars along the Ljubljanica near the Triple Bridge are just a short walk away. They offer a room with a double French bed, bathroom, TV and a small kitchenette with fridge, where you can prepare breakfast (for which basics are provided). The balcony looks out onto the courtyard and has a table and chairs. A local phone is provided which could be used for local calls and to contact B&B staff in case of an emergency. A luggage storage is available too. There is no lift and 40 stairs to top floor. 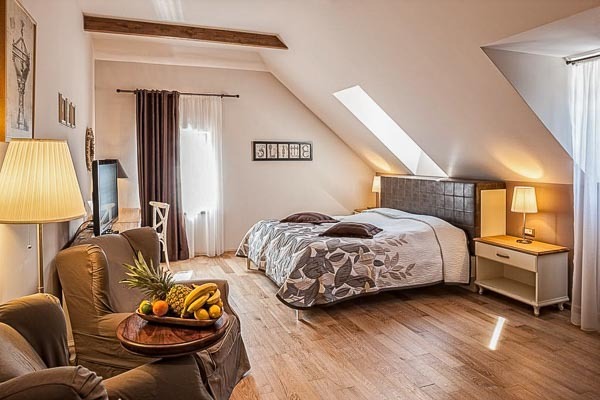 This is a lovely and cosy bed & breakfast in Ljubljana center, located about a 5-minute walk from the old town and about 10 min to the railway and bus station. It is owned by a charming young couple . As it is close to all the main sights, you don’t need an additional transport to move around. There are 17 fully equipped spacious and comfortable rooms. They also own a café which is at street level. It has a very nice outdoor terrace on the upper floor, where you can have your breakfast on warmer days. The pluses of this B&B are a central location and a private parking in the inner courtyard. Stari Tisler guesthouse is situated between the main bus and railway station on one side and the old town on the other, both less than 5 minutes away. 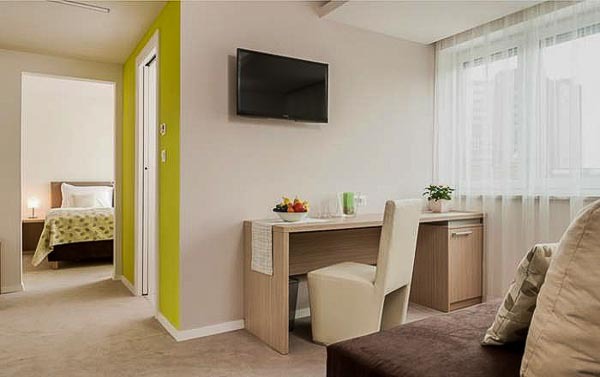 Since so close to the city centre, main city attractions are all within walking distance. It offers 5 cosy rooms with shared bathroom for a reasonable price. 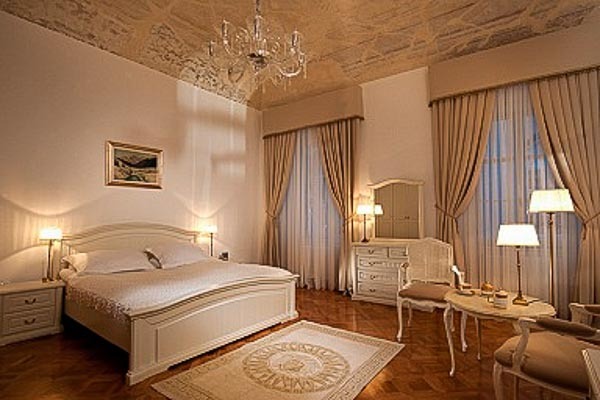 All rooms are equipped with air condition, hair-dryer, towels and linen. If you`re more of a night bird, exit and entrance are possible 24/7. Stari Tisler offers a morning breakfast in their restaurant. Jam and butter, ham and eggs, tea or milk. Just let the personnel know an evening before. If you are in search of a Ljubljana lodging in a peaceful location in the old city centre of Ljubljana, the Pension Pod Lipo is an option to consider. It offers mainly basic double bedrooms with en-suite bathrooms. 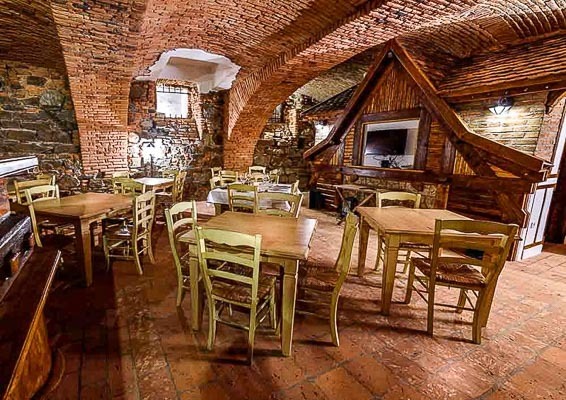 There is a restaurant with traditional Slovene food on the ground floor. It got its name after the old linden from 1626 still standing in its courtyard. Although located centrally, the area is very quiet. This quaint charming guest house is located 20 minutes walk through the Tivoli Park from the town centre and provides a peaceful alternative to the hotels located in town. It is set in a house of historic importance. There is a restaurant within a courtyard and bedrooms arranged around it. Six peaceful, nice and comfortable rooms with 13 beds are available in this guesthouse. All are air-conditioned, have cable TV, free WiFi is accessible throughout the place. 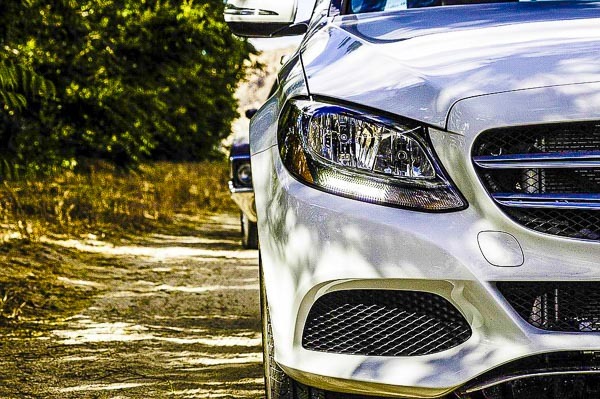 The owners can organise car rental. Ironing facilities and laundry service are available upon request. 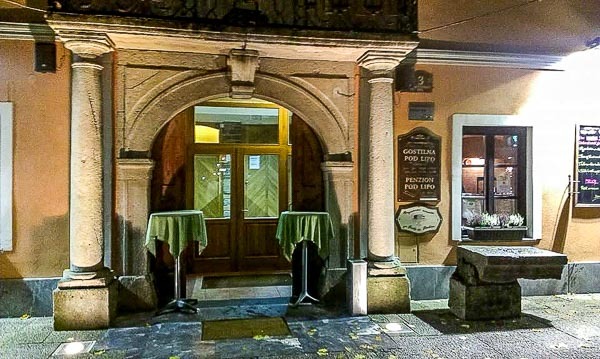 There is a delicious and popular local restaurant below the guesthouse serving traditional Slovenian food. With on-site parking, it is an easy walk to the city centre. In case you are not a passionate walker, it is only five minutes by car. The nearest grocery store and a bus stop can be reached within 50 m. Pets are allowed. Good quality-to-price relation! This beautiful family-owned small B&B is located in a peaceful residential neighbourhood about 3,5 km from the city center. It is super close to the BTC shopping district and thus very appropriate for businessmen working in Ljubljana. As it is placed near the ring road it is also a great starting point for day trips around Slovenia. 12 comfortable, attractively furnished and modern rooms are all equipped with LCD TV, free wi-fi access, hair dryer and a private bathroom. Air conditioning is provided. The restaurant attached to the B & B has been in their family for many years and serves excellent local cuisine and homemade country breakfast. All guests have free access to an underground garage where they can park their cars or motorcycles. The taxi cost to the city centre is €5 – 6. The bus is €1.20 and the stop is two minutes away from the B&B. A couple of old ‘Ljubljana style’ bikes are available for use free of charge. This amazing Eco B&B Tourist Farm is located in the middle of a nature reserve, in a beautiful peaceful location about a 10-minute drive out of Ljubljana. It is a part of the owners’ working farm where they have dogs, donkeys, goats and horses in addition to crops raised. Four eco-friendly holiday apartments are available, built solely on sustainable eco materials. All of the furniture is made from natural Slovenian wood and given a rustic finish. Breakfast offered is organic and locally-produced. 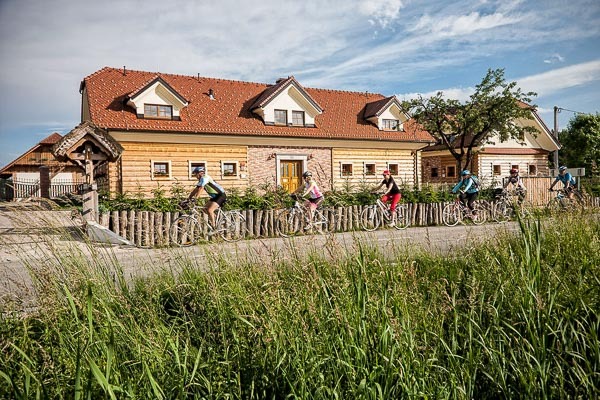 You can rent bikes for free and explore the natural park around Trunlja. Eco wellness is offered as well. A wide range of activities in nature can be organized. A bus station is 50 m away. Dvor Tacen bed & breakfast is a boutique style accommodation located on the edge of the city in the picturesque environment just by the Sava River and at the foothills of Smarna hill and Grmada peak. Distance to the centre of Ljubljana is 8 km. Access to the city centre is easy an comfortable as Dvor Tacen provides guests with Urbana card for the city bus. Ljubljana Airport is a 15-minute drive away. Green surroundings offer many possibilities for sports activities: golf, tennis, walking and running paths, ski slopes are just 20 minutes away. There are a restaurant, a bank, grocery and a post office in the vicinity. 7 rooms offer standard, premium and deluxe accommodation. Slovenian House Vida is a beautiful, very new, modern boutique B&B located on the outskirts of the city about 6 km out of the city center. The location is great if you are exploring Slovenia by car, with Ljubljana as a base. It’s very close to the freeway ring, and easily accessible from other parts of Slovenia and Ljubljana Airport too. A bus stop to the city centre is only 100 m from the B&B and takes approximately 15 minutes to travel to the city centre. This family-run property has 10 spacious rooms with ensuite bathrooms. Apartments on the ground floor have their own private terrace and garden. Breakfast is included in the price, parking is free and they offer bikes for hire. Room rates are very competitive at 60€ per room per night. Your pets are welcome too! This relatively new, comfortable and affordable B&B is located outside the city centre, about 5 km from the Ljubljana Castle and the old town. It has newly furnished modern styled rooms, each comes with a desk and a flat-screen TV. The units provide guests with a shared kitchen and a baggage storage. All the rooms are non-smoking. Free WiFi is available throughout the property. Guests at B&B By The Way can enjoy a continental or a vegetarian breakfast. There is a convenience store on the site just under the premises. Public transportation is just across the street and the staff will provide guests with Urbana Card for usage of city buses. 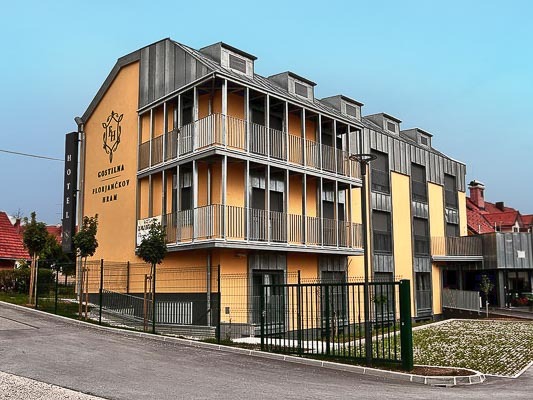 As it is located on the southern ring road so perfect for those who need to reach Ljubljana Airport or would head for day trips to other parts of the country. Free private parking is available on site. Trnovo Golf Course is about 2 km away. 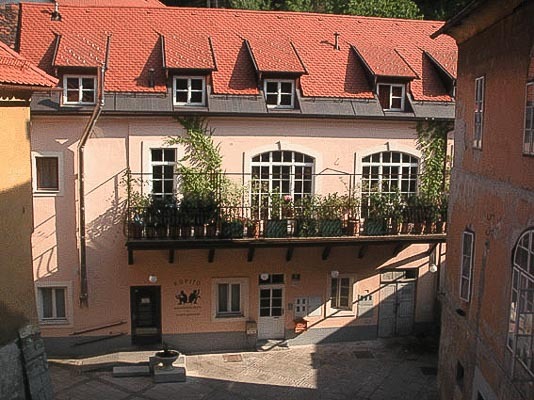 Florjanckov Hram is a traditional family-owned B&B in Ljubljana. The pleasant and quiet location offers professional services and family flair. The traditional breakfast all-you-can-eat menu is one of their highlights – homemade jams, freshly baked selection of bread and eggs. There is a restaurant adjacent to the B&B with traditional Slovenian dishes based on organic food grown in their gardens. Every room has a private bathroom, a flat-screen TV and is air-conditioned. A terrace or balcony are featured in certain rooms. Extras include slippers and a hairdryer. Bikes are available free of charge and upon the previous request. It’s about 5,5 km from the Ljubljana town center, easy to reach from the highway and it’s a quick direct bus ride on routes 6, 8, or 11. The bus stop is near the building. There is a free parking in the backyard, which is very convenient if you’re travelling by car. If you are in Ljubljana for a sports match or some big concert, stadium and Arena Stozice is just 1 km away. For summer refreshment there is Laguna Beach Resort with swimming pools in a walking distance. This is a family-run small hotel, situated in the foothills of the Kamniske and Savinjske Alps, offering a mountain view. Near the city of Kranj, and convenient to Brnik (Ljubljana) airport, the owners offer the airport transfer free of charge. This guesthouse presents a great starting point for hikers and skiers and perfect for those who need an accommodation close to the airport. Pension Zaplata is located 28 km from Ljubljana and 9 km from Ljubljana Airport. Parking is free, self-service home-made breakfast is not to be missed. 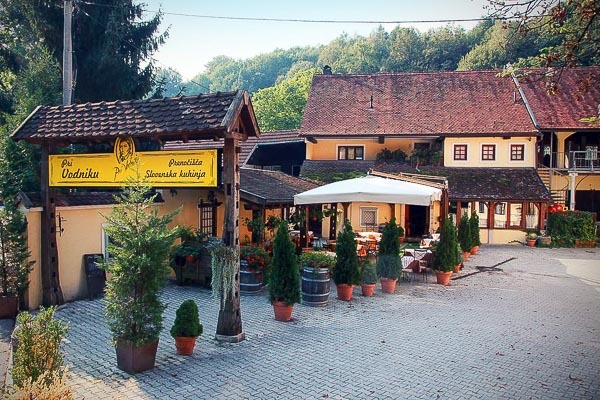 This pension is set 12 km aside from Ljubljana’s city centre in a village called Psata. 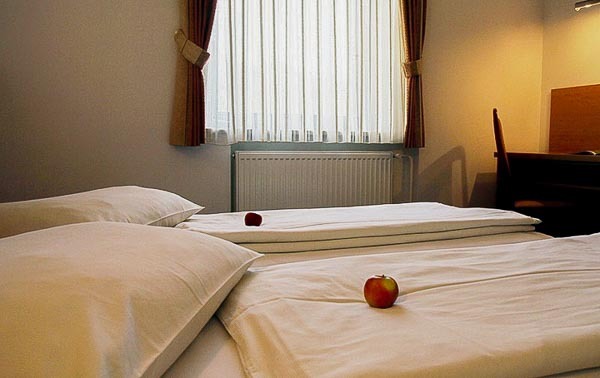 Based near the northern ring road it is a great choice for those travelling by car or those who need to be in direct connection to the Ljubljana Airport (22 km away). For the overnight stay, there are seven double comfortable rooms available. All the rooms are quiet. They come with a private bathroom with a shower, air-conditioning and a flat-screen TV. Free Wi-Fi is provided. There is a free parking just in front of the house. A local bus stop, with frequent lines to Ljubljana, is 500 m away. In addition to accommodation, they offer breakfast, lunch or dinner, as pizzeria & restaurant is just below the accommodation premises.